The 2010 G-20 Seoul Summit was the fifth meeting of the G-20 heads of government, to discuss the global financial system and the world economy, which took place in Seoul, South Korea on November 11–12, 2010. Korea was the first non-G8 nation to host a G-20 Leaders Summit. The theme of the summit was "G-20's Role in the Post-Crisis World. 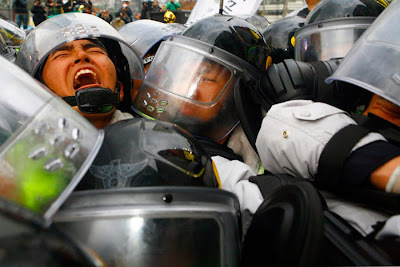 The protesters gathered in Seoul, voicing anger over the G20 policies, which they say restrict labor rights and cut social welfare. They also protested a free-trade agreement that US President Barack Obama plans to sign with South Korea before the summit. Jeffrey received a Bachelor of Arts (Hons) Photography, 2007 Dun Laoghaire Institute of Art Design & Technology, Co. Dublin, Ireland. He is currently working as a freelance photographer whose main interest is to document social and political issues around the world, particularly within Latin America. See more of Jeffrey Bright's work at www.jeffreybright.com.